The Chesapeake and Ohio Canal was started in 1828 as a dream of passage to Western wealth. Operating for nearly 100 years, the canal was a lifeline for communities along the Potomac River as coal, lumber and agricultural products floated down the waterway to market. After closing due to competition from the railroads and the destruction of floods, the area languished in disrepair until it became a target for a parkway in the 1950s. Supreme Court Justice William O. Douglas rallied support for developing the canal as a linear park, and in 1971, it became a National Historical Park. Today, the C&O Canal National Historical Park contains over 20,000 acres of historical, natural and recreational treasures! The Park is the ninth most visited National Park in the nation, with over 5 million visitors a year – that’s more than Yellowstone, Yosemite, or the Grand Canyon! 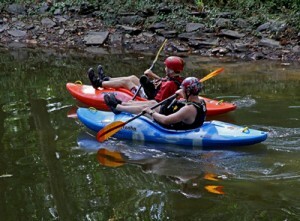 Featuring a 184.5 mile towpath, the Park is popular with hikers and bikers, as well as paddlers who enjoy the neighboring Potomac River and its offshoots. With over 113 rare and threatened species of plants and animals, over 1,000 historic structures, and a rich history of native cultures, transportation growth, and Civil War conflict, the Park has something to offer everyone! The C&O Canal Trust, as the official nonprofit fundraising partner for the C&O Canal, works closely with Park Service staff to assist in maintaining the historic, natural, and recreational treasures in the Park so they will be here for future generations to enjoy! You can learn more about the C&O Canal Trust and give to the Park here.